Cardiogenic Shock Survival Rates Improve Significantly in Three Years Since Impella FDA PMA Approval | ABIOMED, Inc.
DANVERS, Mass.--(BUSINESS WIRE)--Apr. 4, 2019-- Three years ago this week, Abiomed's (NASDAQ: ABMD) Impella heart pump received its FDA PMA approval for AMI cardiogenic shock. At the time of Impella’s FDA PMA approval, the cardiogenic shock survival rate to explant in the Impella Quality Assurance (IQ) Database was 51% in the United States1. Today, Impella heart pumps, combined with the adoption of best practices, which include the use of Impella pre-PCI, have contributed to a significant increase in cardiogenic shock survival and native heart recovery. 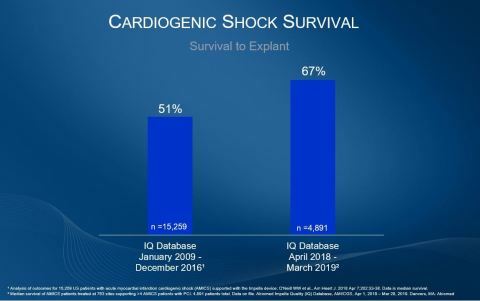 New data from the IQ Database on nearly 5,000 patients treated between April 2018 and March 2019 show an increase in survival from 51% to 67%2, a relative increase of 34% in survival. Journal of Interventional Cardiology, 2014: Placement of Impella pre-PCI is associated with more complete revascularization and improved survival to discharge in the setting of AMI cardiogenic shock (65% with Impella placed pre-PCI vs. 41% post-PCI, p=0.023). American Journal of Cardiology, 2017: Initiation of Impella before PCI and prior to initiation of inotropes or vasopressors is independently associated with improved survival. Survival to discharge was 68%, 46%, 35%, 35%, and 26% for patients requiring 0, 1, 2, 3, and ≥4 inotropes before mechanical circulatory support, respectively (p <0.001), in an analysis of 281 AMI cardiogenic shock patients. Journal of Interventional Cardiology, 2017: Demonstrates a 48% survival at 30 days when Impella is implanted pre-PCI, compared to a 13% survival when Impella is implanted post-PCI for left main in cardiogenic shock (p=0.004). American Heart Journal, 2018: Analysis of 15,259 U.S. patients in the IQ Database demonstrated an improvement in survival to explant from 52% to 59% when Impella was placed pre-PCI (p=0.001). National Cardiogenic Shock Initiative Study Late Breaking Clinical Science, TCT 2018: Data from the first 104 patients utilizing best practices in the National Cardiogenic Shock Initiative (NCSI) Study found 77% survival to discharge with 99% native heart recovery. Circulation, 2018: Analysis reinforces best practices of reduced use of inotropes and placement of Impella pre-PCI leads to improved survival rates. Survival benefit of Impella pre-PCI revealed trend vs “matched” IABP-Shock: 57.3% vs. 46.7% (p=0.18). Significant survival to discharge benefit with Impella in patients who did not receive inotropes (56.6% vs. 29.4% p<0.01). A subset of patients from this paper was presented at American College of Cardiology (ACC) 2019 Scientific Sessions when Andreas Schäfer, MD, presented an abstract that showed improved survival to discharge when Impella is placed pre-PCI of 71% vs. 49% post-PCI (p= 0.0021). Journal of the American College of Cardiology, 2018: Rab, et al., summarizes data from IQ Database, cVAD Study and NCSI and concluded that best practices are associated with improved survival in AMI cardiogenic shock. The most recent results that further validate best practices published online this week in the Journal of the American College of Cardiology. After Inova Heart and Vascular Institute instituted a best practice protocol that includes early use of percutaneous mechanical circulatory support, AMI cardiogenic shock survival at 30 days rose from 44% to 82% (p=0.0001). Cardiogenic shock patients who have benefited from treatment at leading centers from physicians who implanted Impella include Jay Sanchez, Stephon Betts and Ricky Payne. Survival with native heart recovery is the best option for the patient and one of the most cost-effective medical therapies. Impella’s FDA PMA for AMI cardiogenic shock was granted based on the following: Analysis of 494 cardiogenic shock patients from the U.S. Impella Registry (now called cVAD Study) and the RECOVER I FDA Study, safety and effectiveness analysis from FDA studies for high-risk PCI (PROTECT I & PROTECT II RCT), 709 high-risk PCI patients from U.S. Impella Registry, Impella literature review including 692 cardiogenic shock patients and 756 high-risk PCI patients treated with Impella, hemodynamic science demonstrating the benefits of unloading the left ventricle to reduce work and oxygen demand for the left ventricle and perfuse the end organs, the Journal of American College of Cardiology article, Hemodynamics of Mechanical Circulatory Support, D. Burkhoff et al., (2015), and a safety analysis of more than 25,000 Impella-treated patients using the FDA medical device reporting database, which draws from eight years (2008-2016) of U.S. experience with Impella 510(k) clearance. Furthermore, the RECOVER II RCT demonstrated the difficulty in consenting and enrolling these U.S. patients due to ethical and logistical concerns. The intra-aortic balloon pump is now a class III recommendation in Europe and Japan based on the IABP-Shock II study. Impella is the most studied mechanical circulatory support device in the history of the FDA and has exclusive PMA approvals for high-risk PCI, as a therapy to allow for native heart recovery with cardiogenic shock derived from AMI or cardiomyopathy, and right sided heart failure. 1 Analysis of outcomes for 15,259 U.S. patients with acute myocardial infarction cardiogenic shock (AMICS) supported with the Impella device; O'Neill WW et al., Am Heart J. 2018 Apr 7;202:33-38. Data is median survival. 2 Median survival of AMICS patients treated at 763 sites supporting >4 AMICS patients with PCI. 4,891 patients total. Data on file. Abiomed Impella Quality (IQ) Database, AMI/CGS, Apr 1, 2018 – Mar 28, 2019. Danvers, MA: Abiomed.